To fully enjoy Dinan performance spring sets we highly recommend pairing them up with our supplemental ride quality and handling kits. 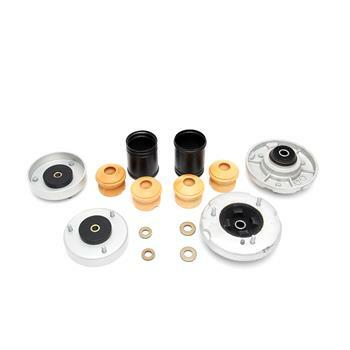 This additional kit includes tuned, progressive rate bump stops that maximize suspension travel on the lowered car for improved handling capabilities and ride quality when compared to just a spring set. By allowing for full compression travel within the spring the possibility of a sudden “bottoming out” is negated, a common unwanted side effect when lowering a vehicle. Bump stops also have the added benefit of optimizing the spring rate rewarding those that use them with added mechanical grip and cornering power. Simply put, the Dinan supplemental ride quality and handling kits amplify performance and comfort when paired with performance spring sets.